Together with our stylist partner Claudia Baillie, we share the key design elements of this eclectic look to help you design your own unique take on this textural trend. We go behind the scenes with Claudia Baillie as she creates her Modern Rustic look Claudia explains what Modern Rustic means to her and shares the inspiration behind her design. Claudia wanted the windows in her Modern Rustic bedroom to feel layered and dressed, so opted for three complementary window dressings. She began with sheer Purity White Roller blinds to diffuse light and provide daytime privacy which she then layered with Acacia Taupe Roller blinds to add in some colour. Because this room has big windows, Claudia softened the look further, finishing with gorgeous floor-to-ceiling curtains in Tetbury Blush. Inspired by lakeside cabins, treehouses and Scandinavian getaways, Claudia’s contemporary bedroom design has all the ingredients for a serene summer escape. The overall look is very natural, with painted wood panelling and wooden floorboards providing a texturally rich canvas. Wood and wicker feature strongly throughout the design, sometimes adding warmth and visual interest, and sometimes acting as a cool foil for layers of cosy textiles. To give the design a fresh and contemporary feel, Claudia introduced warm shades of mustard, ochre and blush pink to the more subtle neutrals. Cushions and throws in linen, velvet, sheepskin and wool envelop the space, while pom-poms, fringing and crochet detailing emphasise the simple styling and pre-loved, handcrafted feel. Claudia’s design features three window dressings, which not only add to the lovely layered feel, but also have a practical purpose, helping to control privacy, light and temperature throughout the year. A sheer Roller blind gently diffuses light and provides daytime privacy, but still allows lots of natural light into the room. A second Roller blind adds colour and can be pulled down over the sheer blind to keep the room cool and dark when you want to sleep in late. And finally, floor to ceiling curtains add softness, contrast and also an extra layer of cosiness on chilly evenings. Most importantly this look should include lots of the things you love. Fill your space with fragrant wild flowers, flea market finds, vintage rugs and well-thumbed books. Then sit back and enjoy the simple, sensory pleasure that comes with the feel, smell and sheer delight of being surrounded by objects, colours and textures that remind you of happy times, places travelled and a life lived. 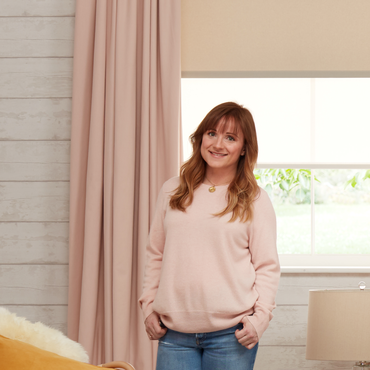 Stylist and fashion journalist, Erica Davies designs a to-die-for Urban Glamour bedroom using Roller blinds from our new collection and shares her style tips to help you get the look at home.